I bet you are familiar with those cliché candy hearts, but did know those little hearts share some history with the pharmaceutical industry? Conversation hearts were first invented in 1847, when Boston pharmacist Oliver Chase decided he wanted to make his fortune in the apothecary lozenge fad of the mid-1800s. While Chase was working as a pharmacist, his industry was changing. Apothecary shops were realizing that for remedies to outsell the competition, they had to be something people wanted to use. Apothecaries began selling sweet lozenges with tasty ingredients that were becoming more affordable. These exciting new offerings instantly became the preferred method of delivery for all sorts of medicines. But there was one barrier to cashing in on the lozenge craze. Up until Chase’s innovation, all lozenges were made by hand, a slow process that limited profits. Recognizing how lucrative speeding up the process could be, Chase invented a machine that instantly formed lozenge dough into perfect little discs ready for sale (that later became the familiar hearts). His machine was the first commercially successful candy machine in the world, and it revolutionized more than just lozenges and candies. Chase’s machine gave rise to generations of pill pressing machines, a technology which fueled the modern pharmaceutical industry. Chase’s candy business grew so profitable that he left the pharmacy behind. His candy company, NECCO, still operates today just outside of Boston, cranking out 100,000 pounds of candy hearts each day, all year long. More than a century later, the unlikely couple of sweets and science is still going strong: in 2003, pharmaceutical giant Novartis, purchased the original NECCO factory building in Cambridge, MA, converting the old factory into a new space for biotech innovation. If LMK made conversation hearts, they would say “Get metrics” and “More training”. Empower your team to ask for clarification or assistance without fear. We all need to speak from the heart. Don’t be afraid to lead tough conversations about the TMF. You’d be surprised how frequently TMF stakeholders don’t ask questions because they don’t know who to ask or don’t feel comfortable speaking up. Sometimes, less is more. A successful TMF is built on concrete and discrete processes. Start with a well-developed TMF QC Plan with a clearly defined scope. Create SOPs, responsibility matrices, TMF QC trackers, and timelines well in advance of startup. Even the simplest processes will benefit from pre-planning. 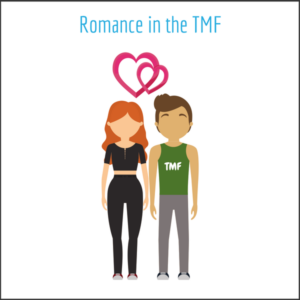 A TMF doesn’t need to be massive or complex to be considered a success. The biggest innovations come from the humblest beginnings. From cardboard boxes to online databases, the TMF has always been important despite decades of technological change. Let the simplicity of those old cardboard boxes keep you focused on what matters: the people behind the TMF and the story the TMF needs to tell. Of course, electronic tools are important, but those tools can only bring you so far. The medium of the TMF is akin to the paper a book is printed on—it’s the words (not the paper) that make a book powerful and unforgettable. We believe the biggest TMF innovations can come from people and processes, not just technology. You might not think the TMF is the most romantic part of your clinical trial, but we feel differently at LMK. By improving the quality of the TMF, we’re confident the world will come to know groundbreaking treatments that might not have otherwise succeeded. Now that’s a romantic idea we all want to talk about.